Buffalo State will honor four individuals who have made significant contributions to its art conservation program with a naming dedication ceremony on Friday, September 18, at 5:30 p.m. in the lobby of Rockwell Hall. The donors will be present along with Buffalo State President Katherine Conway-Turner and representatives from the Art Conservation Department, the School of Arts and Humanities, the Institutional Advancement Office, and the College Council. Founded in 1970, the art conservation program is one of the leading graduate programs of its kind in North America and accepts only 10 students a year. 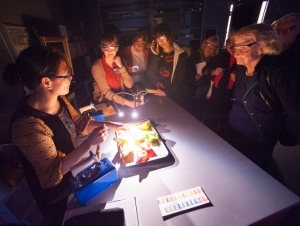 Program graduates can be found in the conservation labs of major institutions across the United States, including the Smithsonian Institute, the National Gallery of Art, the Library of Congress, the Metropolitan Museum of Art, and the Museum of Modern Art in New York. Plaques bearing the names of each donor will be presented at the ceremony. Bruce and Gail Johnstone Conference Room, named for the fifth president of Buffalo State (1979–1988) and former chancellor of the State University of New York (1988–1994) and his wife, Gail, who served as planning director for the City of Buffalo, vice president of planning for Roswell Park Cancer Institute, and president and CEO of the Community Foundation for Greater Buffalo. As president, Johnstone initiated the Muriel A. Howard Honors Program (then All College Honors Program) and transferred the Cooperstown Graduate Program in the Conservation of Historic and Artistic Works from SUNY Oneonta to Buffalo State in 1987. In January 2014, the SUNY Board of Trustees appointed Johnstone as chancellor emeritus, a title conferred to only three other past chancellors in SUNY history. The couple will be supporting talented students through the Bruce and Gail Johnstone Art Conservation Fellowship. F. Christopher Tahk Conservation Science Teaching Lab, named for the ‘75 alumnus of the Cooperstown Graduate Program in the Conservation of Historic and Artistic Works at SUNY Oneonta. Tahk also served as former art conservation faculty member and director of the program from 1983 to 2004, in which he oversaw its transition to Buffalo State in 1987. Additionally, he was named a SUNY Distinguished Service Professor in 1997 and he received two awards from the American Institute for Conservation of Historic and Artistic Works: the Conservation Advocacy Award (2004) and the Sheldon and Caroline Keck Award (1997). Upon his retirement in 2004, he established an endowed fellowship in his name. Marianne Vallet-Sandre Art Preparation Studio, named for an alumna who also was a Buffalo State faculty and staff member. A native of Paris, France, Vallet-Sandre earned degrees in art education, ’58, and education, ’65. She joined the college’s new Design Department in 1973 and was named chair six years later. She became executive assistant to college President Johnstone in 1983 and advanced many challenging projects including the 1987 acquisition of the Cooperstown Graduate Program in the Conservation of Historic and Artistic Works from SUNY Oneonta. She returned to the Design Department in 1989 and retired in 2000. She established the Marianne Vallet-Sandre Art Conservation Graduate Fellowship Fund to support talented students.